Hello! Here is a great post from a blog friend of mine. Sarah runs an awesome blog and I definitely think you should check it out. When I was 18, I remember thinking that if I only I could make $15/hour, I’d be set. At the time, I had just started my first year of college, and was working full-time to pay for it. I was making $12/hour all in, including commission, my hourly wage, and bonuses, and between tuition, rent, and living expenses, I was living paycheck to paycheck. Little did I know that eight years later, I would be making quadruple that which I was making at 18, and that I would be willingly leaving a job that not only paid far more than $15/hour, but also came equipped with a lucrative pension plan, amazing health insurance and an office I couldn’t have even imagined at my retail job. If you had told me that I would have not only the funds but the freedom to travel, I’d have thought you were nuts. But in February 2015, the day after my 26th birthday and my last day of work, I got on a plane with a one-way ticket to Europe and went to go explore a little bit of the world before returning home to pursue meaningful work that I love. I’m not special or rich or have any unusual advantages. I think that with a little bit of planning, you can do this too. Yes, even if you have a mortgage. Even if you have bills to pay. Even if you have responsibilities. I have all of those things, but I still was able to do this. Here are four steps that I took to prepare for the journey. Michelle talks a lot about side income and earning extra money, and I completely understand why. Earning a side income is easily one of the most practical ways to find financial and career freedom. I started making money on the side four years ago with my blog, but because I had a rock-solid career I didn’t think I needed to earn more. In the middle of 2014, however, I began to become dissatisfied with the traditional career trajectory that we’re all supposed to take. 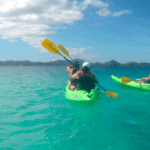 I wanted to travel, and travelling in 3 weeks of vacation time each year seemed ridiculous to me. 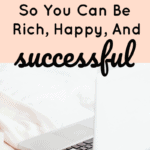 I had started another side business – this time, an Etsy shop – which began to earn money right away, and between that and my other online income streams, I had ramped up my side income to the point where I could almost outpace my day job income. Think you can’t do this because you don’t have a side income? I disagree. Finding side income isn’t difficult. Stop and think about it: what is one thing you could do right now to earn you $100? I’d bet that you – and most people reading this – can think of one thing. And it probably wouldn’t take you that long. 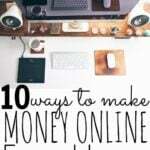 If you could earn $100, what is stopping you from replicating that and earning even more? You could earn thousands of dollars extra each month, but that will get you nowhere if you’re just spending those dollars. When I decided I wanted to quit my job and travel, I also accepted that I needed to make a few sacrifices to do so. I didn’t do a ramen famine, but I was more careful with my spending. My husband and I ate at home more often and had friends over instead of going out. We began to carpool to and from work, and negotiated some of our bills down. I have a mortgage, so I knew that when I went away, the mortgage wouldn’t go away with me. I couldn’t do anything about that bill right away, so we found other areas to cut back instead. Our savings rate increased, and we held on to more of our money. I’m very fortunate in that I haven’t need the backup plan – far from it! – but it was still a very important aspect of my financial “quit” plan to have a plan B. No matter how brave entrepreneurs seem when they go to quit their day jobs, make no mistake: we’re all shaking in our boots at the thought of leaving a stable income for work we love. I had dreams about all of my side-business income sources drying up like a watering hole in the desert at the same time, and my husband losing his job or ending up in some hostage situation in Europe that happened to drain our savings (okay.. I didn’t say they were realistic dreams). Something that really put my mind at ease, however, was having a backup plan. I always knew that the worst that could happen was that I would have to get another job in my professional field of work. So I made a backup plan of how I would go about doing that, which put my mind at ease. When I decided to quit my job, I knew that I would want to travel more extensively when I returned from my trip, and I knew I wanted more flexibility in my work than what my 9-5 allowed. To prepare for this career shift, I began to build a business that would allow me to sustain a lifestyle as a digital nomad while also doing work that I loved. I threw myself into building Unsettle, just as I threw myself into building a career by pursuing my degree and putting in long hours at the office. I could have come back from my trip and found another job, but the point was not only to travel. After all, the trip only ended up being about six weeks in length. The point was to take my career into my own hands, empower myself to work when, where, and on what I want, and maintain a lifestyle of freedom. I could have continued growing my side businesses, but I do believe that diversifying your income is important, and my side businesses were best left as just that – side businesses. The beautiful thing about the internet is that it empowers everyone with access to it to pursue what they love. Even if it takes you a little longer than it took me. Even if you have to burn the midnight oil building something on the side while you work your day job. Even if you are in a position right now where you’re living paycheck to paycheck, paying your way through school and dreaming of $15/hour. If you start something – if you take action – you absolutely can do what you love. Sarah Peterson is the author of Unsettle.org, where she helps people stop settling for “okay” lives and careers. 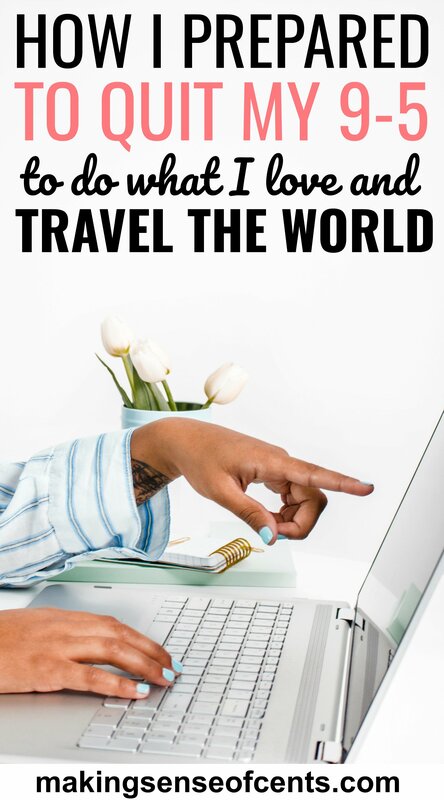 Sign up for her free course to find the perfect idea for a lifestyle business so you can travel whenever you want, too. Great advice and truly inspirational to see you quit your job so young. It really boils down to setting priorities and putting in the work needed to achieve them. Congrats! Very inspiring story! I agree that you won’t get too far if you spend all the extra income you earn. I’m currently using side hustle income to help pay off my debt so I can get ahead in life and become more financially stable so I can make the decision to make the jump to self employment one day. Awesome, Chonce – I’m glad you’re using side hustle income to pay off debt. That will open up a lot of doors for you. Unsettle. Great concept. Congrats on making it work for you. With my growing family, I’m not looking to unsettle any time soon, but surly would have enjoyed it in my 20s. That’s interesting! Unsettling is actually largely driven by my desire to have and grow a family – I couldn’t imagine having to do the 9-5 thing in a job I didn’t love working to build somebody else’s dream while also juggling a growing family and trying to spend as much time as possible with them. But we’re all in different situations. Thank you for reading! Seeing people like you succeed at what they love doing is the force I’m using to push myself into having the most fulfilled life I can dream of. I have a full time job that I dread every single day, and all the stress is not worth it at all when I can’t even make $14,000 a year after taxes. All I want is to wake up happy and love my job, and I love knowing that this is very possible! It’s definitely possible – I’m so sorry to hear about your job, but there’s a light at the end of the tunnel! Congrats, Danica! And it’s great to have side income to help you until you’ve build your business completely. What are some of the ways you made money with your blog? Can you share some of the secrets? I have noticed that is in the heart of a lot of Bloggers to help others do the same as they are doing (or similar). I think it is great and I hope we can all inspire other women (and men) to find what they are good at and find ways to build that into a business.Thank you for sharing your story. You make some excellent points and ones I put in place before deciding to actively pursue my dreams. That was nearly two and a half years ago and while there have been a few nightmares along the way, I don’t regret a moment of this journey. I’ve never been more content (or busy) than I am now. Still not quite there but it’s within sight. I’m so glad you’ve already made the leap to follow your dreams Diane! Great post Sarah. We’ve been travelling for nearly a year now and I agree with everything you’ve said. I have been slowly been building my freelance income whilst we’ve been travelling but the majority of our funds are from savings and rental income. We were able to rent our house out while we travelled and it makes a small profit after expenses so that helps. Of course we had some frugal years before this but it was worthwhile. This year we enrolled our son in preschool here in Spain and his Spanish language development has been amazing. He sounds like a little Spanish kid. I feel so blessed to be able to give him this opportunity. It keeps me motivated to build my freelance business into a powerful earning machine so we can continue to travel as and when we want. Plus it doesn’t hurt that I love the work I do! Emma, that’s awesome! I’m so inspired to hear that you Unsettled with a child – that’s an excuse for many people NOT to, but I think if anything it should be a driving factor to actually do it. Such a great advice Sarah! 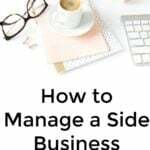 I totally agree with you that having a side income is easily one of the most practical ways to find financial and career freedom. Interesting read… I tossed some digital-download items up on Etsy right away and was shocked when I sold a few within a day or so. Time to take this more seriously I guess. Thanks!